Hey CTK fans, it's Sunday Sketch time again! I have a 12x12 layout to share with you all today inspired by this weeks awesome sketch. 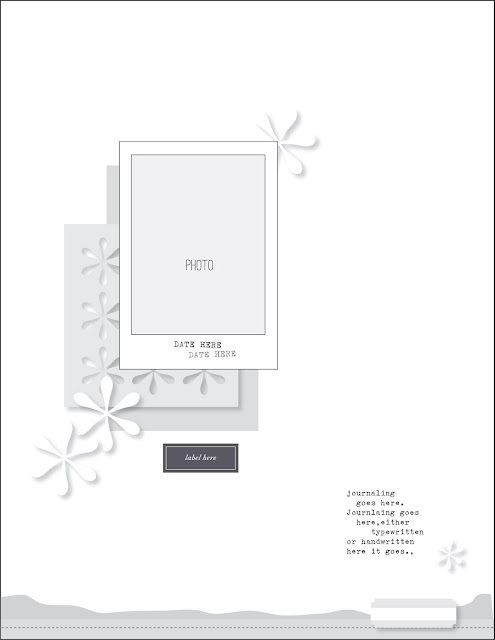 I'm using the new and seriously delightful 'Photobooth' Main & Add-On kits. 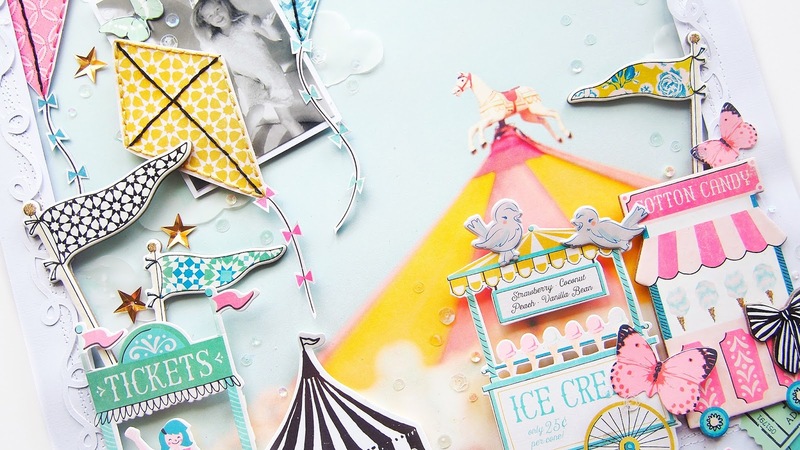 I was immediately drawn to the Maggie Holmes Carousel 'Magical' paper in the Add-On kit. I thought it could make a really interesting background for a page, but I wasn't sure how best I could use it. Once I saw the sketch I knew I had to try and make the paper work because there are embellishment clusters in the bottom right of the sketch, and the Carousel roof design on the paper is also in the same corner. I love my white space, so using a patterned paper background is a really daunting task for me, so I'm happy I stepped out of my comfort zone! I decided to add a frame around the entire paper, and I loved how it looked. It contained the paper's design and helped make it make a little more sense in my head! I added a lot of the embellishments to the bottom of the page. 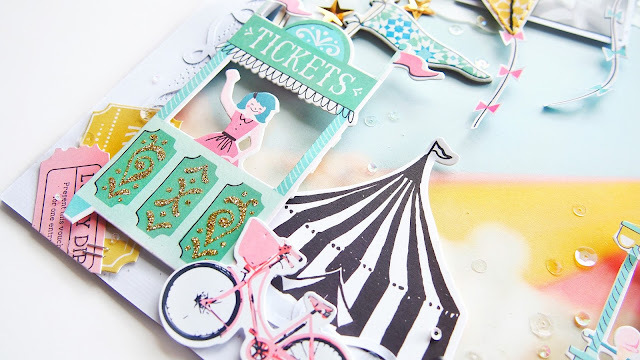 I used three of these adorable ticket and food stands from both the Carousel ephemera pack and chipboard, and clustered them on top of the frame. 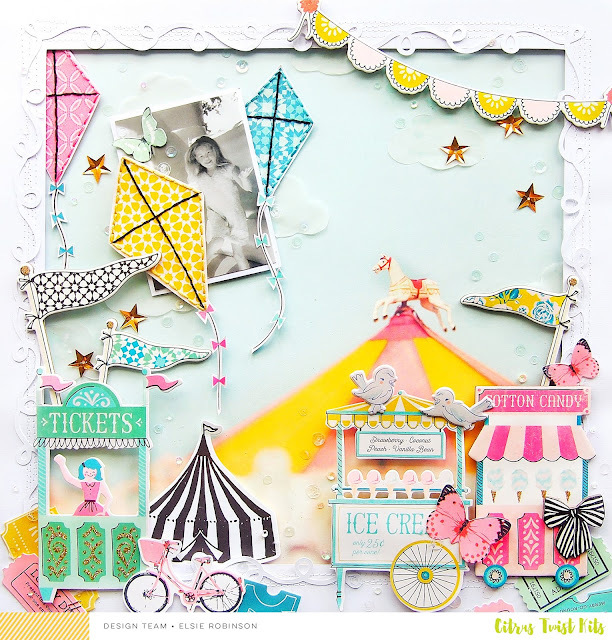 This gives the layout some more perspective as it looks like the stands are in the "foreground", the frame is the "middle ground" and the patterned paper is the "background". It's obviously not "to scale", but this idea helps all of these larger pieces work together and make sense when you're looking at the page. I placed my photo in the same position as in the sketch. 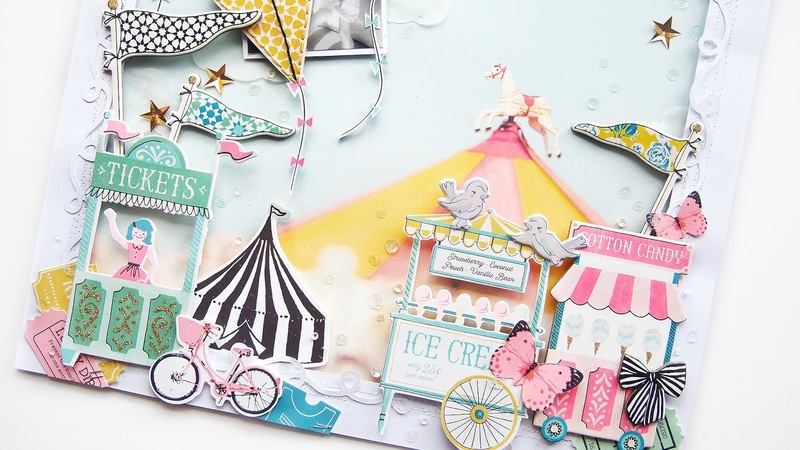 It looked a bit random without any embellishments around it, so I fussy-cut some kites from the Carousel collection 'Summertime' paper. I jazzed up these kites by stitching around them with some thread of the same colour... I can never stray too far away from a needle and thread! And how cute are the CTK exclusive puffy stickers in the Main kit? Those birds are so adorable, I couldn't resist having them perch on top of the ice cream stand! And now it's your turn! To play along with this week's challenge, create a layout inspired by the sketch, upload it to the Citrus Twist Kits Gallery with the sketch date (8/06) in the title, and you might win a $5 gift certificate to the CTK store - yay! Why do You create albums?